This article is about the mythical creature tomte/nisse. For the band, see Tomte (band). A tomtenisse made of salty dough. A common Scandinavian Christmas decoration. A nisse (Danish: [ˈnesə] and Norwegian: [²nɪsːɛ]), tomte (Swedish: [²tɔmːtɛ]), tomtenisse, or tonttu (Finnish: [tontːu]) is a mythological creature from Nordic folklore today typically associated with the winter solstice and the Christmas season. It is generally described as being no taller than 90 cm (3 ft), having a long white beard, and wearing a conical or knit cap in red or some other bright colour. They often have an appearance somewhat similar to that of a garden gnome (which are also called trädgårdstomte in Swedish, havenisse in Danish, hagenisse in Norwegian and puutarhatonttu in Finnish). The nisse is one of the most familiar creatures of Scandinavian folklore, and he has appeared in many works of Scandinavian literature. With the romanticisation and collection of folklore during the 19th century, the nisse would gain popularity. In the English editions of the fairy tales of H. C. Andersen the word nisse has been inaccurately translated as goblin (a more accurate translation is brownie or hob). The nisse/tomte is an echo of ancient ancestral cult. He was sometimes seen as the farmer who cleared the forest to build the farm and who in pre-Christian times would have been buried on the farm in a mound. He was sometimes referred to as the haugkall or haugebonde, from the Old Norse haugr meaning mound. Other names are tuftekall, tomtegubbe, all names connecting the being to the origins of the farm (the building ground) or a burial mound. It was thought that the nisse was a more generalized spirits of previous generations at the homestead, and there are references to them following the family/clan, when they are moving. Nisse may be derived from Norse niðsi, meaning "dear little relative" or from the Germanic water-sprite nixie.Nisse is also a common name in Danish and the Scanian dialect in southernmost Sweden; as a nickname for Niels and Nils, and its usage in folklore comes from expressions such as Nisse god dräng ("Nisse good lad", cf. Robin Goodfellow). 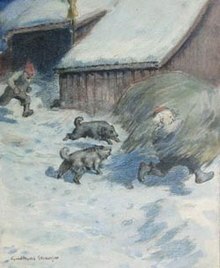 The words tomte and tonttu are derived from the term for a place of residence and area of influence: the house lot, tomt (Swedish) or tontti (Finnish). The nisse/tomte was often imagined as a small, elderly man (size varies from a few inches to about half the height of an adult man), often with a full beard; dressed in the traditional farmer garb, consisting of a pull-over woolen tunic belted at the waist and knee breeches with stockings. This was still the common male dress in rural Scandinavia in the 17th century, giving an indication of when the idea of the tomte spread. However, there are also folktales where he is believed to be a shapeshifter able to take a shape far larger than an adult man, and other tales where the nisse is believed to have a single, cyclopean eye. In modern Denmark, nisser are often seen as beardless, wearing grey and red woolens with a red cap. Since nisser are thought to be skilled in illusions and sometimes able to make themselves invisible, one was unlikely to get more than brief glimpses of him no matter what he looked like. Norwegian folklore states that he has four fingers, and sometimes with pointed ears and eyes reflecting light in the dark, like those of a cat. An illustration made by Gudmund Stenersen of an angry tomte stealing hay from a farmer. Despite his small size, the nisse possessed an immense strength. He was easily offended by careless lack of proper respect and lazy farmers. As the protector of the farm and caretaker of livestock, and his retributions for bad practices ranged from small pranks like a hard strike to the ear to more severe punishment like killing off the livestock or ruining of the farm's fortune. Observance of traditions was thought important to the nisse as he did not like changes in the way things were done at the farm. He was also easily offended by rudeness: farm workers swearing, urinating in the barns, or not treating the creatures well would do so under the threat of a sound thrashing by the tomte/nisse. If anyone spilled something on the floor in the house, it was considered proper to shout a warning to the tomte below. An angry tomte is featured in the popular children's book by Swedish author Selma Lagerlöf, Nils Holgerssons underbara resa genom Sverige (Nils Holgersson's Wonderful Journey Through Sweden). The tomte turns the naughty boy Nils into a tomte in the beginning of the book, and Nils then travels across Sweden on the back of a goose. One was also required to please the spirit with gifts (see Blót) – a particular gift was a bowl of porridge on Christmas night. If the tomte was not given his payment, he would leave the farm or house, or engage in mischief such as tying the cows' tails together in the barn, turning objects upside-down, and breaking things (like a troll). The nisse liked his porridge with a pat of butter on the top. In an often retold story, a farmer put the butter underneath the porridge. When the nisse of his farmstead found that the butter was missing, he was filled with rage and killed the cow resting in the barn. But, as he thus became hungry, he went back to his porridge and ate it, and so found the butter at the bottom of the bowl. Full of grief, he then hurried to search the lands to find another farmer with an identical cow, and replaced the former with the latter. In another tale a Norwegian maid decided to eat the porridge herself, and ended up severely beaten by the nisse. The being swore: "Have you eaten the porridge for the nisse, you have to dance with him!". The farmer found her nearly lifeless the morning after. The nisse is connected to farm animals in general, but his most treasured animal was the horse. Belief had it that one could see which horse was the tomte's favourite as it would be especially healthy and well taken care of. Sometimes the tomte would even braid its hair and tail. Sometimes actually undoing these braids could mean misfortune or angering the tomte. Some stories tell how the nisse could drive people mad, or bite them. The bite from a nisse was poisonous, and otherworldly healing was required. As the story goes, the girl who was bitten withered and died before help arrived. The nisse or tomte was in ancient times believed to be the "soul" of the first inhabitor of the farm; he who cleared the tomt (house lot). He had his dwellings in the burial mounds on the farm, hence the now somewhat archaic Swedish names tomtenisse and tomtekarl, the Swedish and Norwegian tomtegubbe and tomtebonde ("tomte farmer"), Danish husnisse ("house nisse"), the Norwegian haugkall ("mound man"), and the Finnish tonttu-ukko (lit. "house lot man"). The nisse was not always a popular figure, particularly during and after the Christianization of Scandinavia. Like most creatures of folklore he would be seen as heathen (pre-Christian) and be demonized and connected to the Devil. Farmers believing in the house tomte could be seen as worshipping false gods or demons; in a famous 14th century decree Saint Birgitta warns against the worship of tompta gudhi, "tomte gods" (Revelationes, book VI, ch. 78). Folklore added other negative beliefs about the tomte, such as that having a tomte on the farm meant you put the fate of your soul at risk, or that you had to perform various non-Christian rites to lure a tomte to your farm. The belief in a nisse's tendency to bring riches to the farm by his unseen work could also be dragged into the conflicts between neighbours. If one farmer was doing far better for himself than the others, someone might say that it was because of him having a nisse on the farm, doing "ungodly" work and stealing from the neighbours. These rumours could be very damaging for the farmer who found himself accused, much like accusations of witchcraft during the Inquisitions. The nisse shares many aspects with other Scandinavian wights such as the Swedish vättar (from the Old Norse vættr), Danish vætter, Norwegian vetter or tusser. These beings are social, however, whereas the tomte is always solitary (though he is now often pictured with other tomtar). 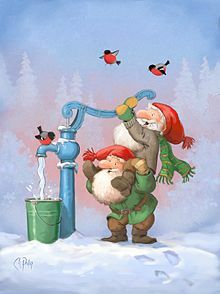 Synonyms of tomte includes gårdbo ("(farm)yard-dweller"), gardvord ("yard-warden", see vörðr) in all Scandinavian languages, and god bonde ("good farmer"), gårdsrå ("yard-spirit") in Swedish and Norwegian and fjøsnisse ("barn gnome") in Norwegian. The tomte could also take a ship for his home, and was then known as a skeppstomte or skibsnisse. In Finland, the sauna has a saunatonttu. In other European folklore, there are many beings similar to the tomte, such as the Scots and English brownie, Northumbrian English hob, West Country pixie, the German Heinzelmännchen, the Dutch kabouter or the Slavic domovoi. The Finnish word tonttu has been borrowed from Swedish. The tradition of nisse/tomte is also associated with Christmas (Swedish: Jultomten, Danish: Julemanden, julenissen, Norwegian: Julenissen or Finnish: Joulutonttu.) The tomte is accompanied by another mythological creature: the Yule goat (Julbocken). The pair appear on Christmas Eve, knocking on the doors of people's homes, handing out presents. The nisse will deliver gifts at the door, in accordance with the modern-day tradition of the visiting Santa Claus, enters homes to hand out presents. The tomte/nisse is also commonly seen with a pig, another popular Christmas symbol in Scandinavia, probably related to fertility and their role as guardians of the farmstead. It is customary to leave behind a bowl of porridge with butter for the tomte/nisse, in gratitude for the services rendered. In the 1840s the farm's nisse became the bearer of Christmas presents in Denmark, and was then called julenisse (Yule Nisse). In 1881, the Swedish magazine Ny Illustrerad Tidning published Viktor Rydberg's poem "Tomten", where the tomte is alone awake in the cold Christmas night, pondering the mysteries of life and death. 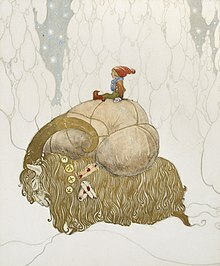 This poem featured the first painting by Jenny Nyström of this traditional Swedish mythical character which she turned into the white-bearded, red-capped friendly figure associated with Christmas ever since. 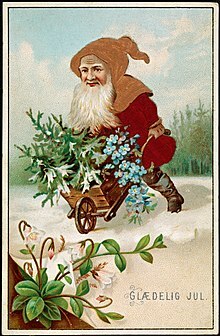 Shortly afterwards, and obviously influenced by the emerging Father Christmas traditions as well as the new Danish tradition, a variant of the nisse/tomte, called the jultomte in Sweden and julenisse in Norway, started bringing the Christmas presents in Sweden and Norway, instead of the traditional julbock (Yule Goat). Gradually, commercialism has made him look more and more like the American Santa Claus, but the Swedish jultomte, the Norwegian julenisse, the Danish julemand and the Finnish joulupukki (in Finland he is still called the Yule Goat, although his animal features have disappeared) still has features and traditions that are rooted in the local culture. He doesn't live on the North Pole, but perhaps in a forest nearby, or in Denmark he lives on Greenland, and in Finland he lives in Lapland; he doesn’t come down the chimney at night, but through the front door, delivering the presents directly to the children, just like the Yule Goat did; he is not overweight; and even if he nowadays sometimes rides in a sleigh drawn by reindeer, instead of just walking around with his sack, his reindeer don’t fly — and in Sweden, Denmark and Norway some still put out a bowl of porridge for him on Christmas Eve. He is still often pictured on Christmas cards and house and garden decorations as the little man of Jenny Nyström's imagination, often with a horse or cat, or riding on a goat or in a sled pulled by a goat, and for many people the idea of the farm tomte still lives on, if only in the imagination and literature. The use of the word tomte in Swedish is now somewhat ambiguous, but often when one speaks of jultomten (definite article) or tomten (definite article) one is referring to the more modern version, while if one speaks of tomtar (plural) or tomtarna (plural, definite article) one could also likely be referring to the more traditional tomtar. The traditional word tomte lives on in an idiom, referring to the human caretaker of a property (hustomten), as well as referring to someone in one's building who mysteriously does someone a favour, such as hanging up ones laundry. A person might also wish for a little hustomte to tidy up for them. A tomte stars in one of author Jan Brett's children's stories, Hedgie's Surprise. 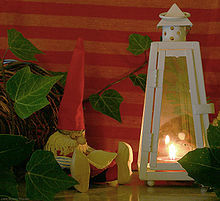 Nisser/tomte often appear in Christmas calendar TV series and other modern fiction. In some versions the tomte are portrayed as very small; in others they are human-sized. The nisse usually exist hidden from humans and are often able to use magic. ^ Carlson, John. "A Gnome By Any Other Name". The Paranormalist. Retrieved 2 December 2013. ^ Grønvik, Ottar (1997). "Mål og mening". Mål og Minne. 2: 129–148. ^ Friedman, Amy. Go San Angelo: Standard-Times. "Tell Me a story: The Tomte's New Suit (A Swedish Tale) Archived 2013-12-03 at the Wayback Machine. Retrieved 2 December 2013. ^ Local.se. "Introducing... Christmas Tomte.". Retrieved 2 December 2013. Wikimedia Commons has media related to Nisser (Folklore). Wikimedia Commons has media related to Tomtar. This page was last edited on 19 January 2019, at 18:55 (UTC).